The Ssangyong Motor Company strike and plant occupation in Pyeongtaek, South Korea, ended after 77 days on Aug. 5. For the 976 workers who seized the small auto plant on May 22 and held it against repeated quasi-military assault, the settlement signed by Ssangyong court receivership manager Park Young-tae and local union president Han Sang-kyun represented a near-total defeat. Worse still, the surrender was followed by detention and interrogation of dozens of strikers by police, possibly to be followed by felony charges, as well by a massive ($45 million) lawsuit against the Korean Metal Workers’ Union and probable further lawsuits against individual strikers for damages incurred during the strike. The hard-right Korean government of Lee Myong Bak is signaling with these measures—its latest and most dramatic “take no prisoners” victory over popular protest in the past year and a half-- its intention to steamroller any potential future resistance to its unabashed rule on behalf of big capital. When we finished night shift work at 5:30 this morning, we went to Pyeongtaek to the front gate of the Ssangyong factory where the struggles were going on, just as they had on the previous day. Later that day, a police helicopter was spreading tear gas against workers who were fighting on the housetops. Starting July 20th, with a court order, more than 3,000 riot police, including a ranger unit, had tried to seize the plant and ordered workers out of the factory. After the workers rejected this order, the police launched an attack against occupying workers for 7 consecutive days, and this attack also involved hired thugs and scabs from workers not laid off. We will fight unflinchingly and regain our rights and return to our homes at last. 100 strikers had left the occupation throughout the night (many out of disgust at the ruthlessness of the state and company's violence). In the final negotiations, the local union president agreed to early retirement (i.e. layoff with severance pay) for 52% of the occupiers, with 48% furlough for one year without pay, after which they will be rehired, economic conditions permitting. The company will also pay a 550,000 won monthly subsidy for one year to some workers transferred to sales positions. The Ssangyong defeat cannot be attributed merely to the lame role of the KMWU national organization, which from the beginning allowed the negotiations to be channeled in a narrow focus on “no layoffs”. (By contrast, the local union president, who ultimately signed the surrender document, stayed in the occupied plant right to the end, even though he was not on the layoff list.) Nor can the defeat be fully explained by the atmosphere of economic crisis. Both of these factors undoubtedly played a major role. But above and beyond their undeniable impact, it is the year-in, year-out rollback of the Korean working class, above all through casualization, which now affects more than 50% of the work force. 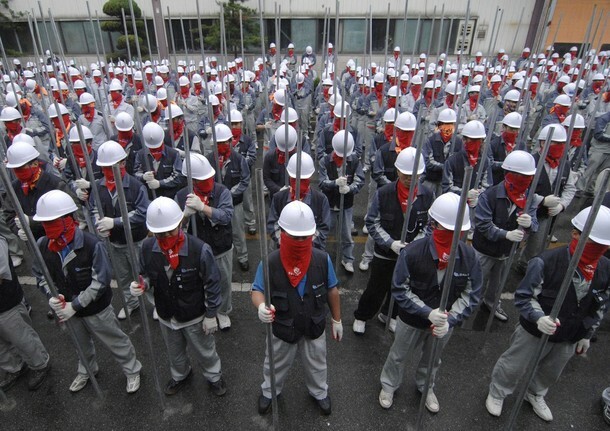 1 Thousands of workers from nearby plant did repeatedly aid the Ssangyong strike, but it was not enough. The defeat of the Ssangyong strikers, despite their heroism and tenacity, will only deepen the reigning demoralization until a strategy is developed that can mobilize sufficiently broad layers of support, not merely to fight these defensive battles but to go on the offensive. I wonder if this saga will at least help turn public opinion more firmly against the right-wing government...? While this is a good article, I wonder if it isn't too pessimistic. While this was largely a defeat, it did win significant concessions, including improved pay off for half the workers, and unpaid leave to be followed by re-employment for the other half. This whole experience does clearly demonstrate, however, that occupation alone is not enough to win - as with the Visteon dispute and the Lindsay strikes, the key to victory is in spreading the struggle as much as possible. And in this case that did not happen sufficiently. That being said, it says a lot for how far South Korea has come. They are lucky these days to be able to strike in the first place. I feel you're missing a lot out here. "it says a lot for how far South Korea has come." You mean the concessions won by the korean workers? "They are lucky these days to be able to strike in the first place." They aren't lucky, it's their weapon/tool. This sentence doesn't make any sense.